16th June, Manila: Fifth-seed, Wu Siu Hong of Hong Kong defeated local hopeful, Markwin Tee to claim his first title this year in the 36th PBC-Boysen International Open while Filipina, Liza del Rosario reclaim the ladies' crown she won in 2000. Wu forced top-seed, Markwin Tee of MTBA to the deciding match after he took the first match, 215-189. In the second match, the Filipino had no answer to the form Wu displayed as the champion cruised to a comfortable victory over Markwin, 269-202 to claim the Men's crown. The Hong Kong 'Wonder Boy', who finished fifth in the earlier second block, knocked out fourth-seed, RJ Bautista of ATBA-Timberpro and sixth-seed, Syafiq Ridhwan of Malaysia, 255-190-223 to progress to the next match. Wu put in another superb performance to beat second-seed, Ryan Lalisang of Jaya Ancol Bowl, Indonesia and third-seed, Oh Young Ki of Korea in an equally convincing fashion, 258-257-227 to earn a crack at the coveted title. Markwin Tee had to settle for second despite topping the second block with a total of 3530 ahead of Ryan Lalisang with 3516. Overnight leader, Oh Young Ki finished third with on 3507 ahead of RJ Bautisa fourth with 3440, Wu fifth with 3329 and Syafiq Ridhwan making the final stepladder spot with 3328. Meanwhile, in the ladies' division, local favourite, Liza del Rosario reclaimed the title she last won in 2000 when she edged Syakirah Yeoh of Malaysia, 183-181 in the final stepladder match. Rosario finished as top-seed after she amassed a total of 3589 in the earlier second block finals. In the first stepladder match, fourth-seed, Syakirah Yeoh ousted fifth-seed, Chan Shuk Han of Hong Kong and sixth-seed, Marjo Reyes of TBAM-Prima-Powerbowl-PJB, 216-170-202 to progress to the next match. Syakirah continued her fine form to outclass, teammate and second-seed, Zatil Iman and third-seed, Kim Eun Jung of Korea, 249-190-193 but when matched against the more-experienced Filipina, Syakirah could repeat the form she displayed earlier. Wu Siu Hong pocketed the top prize of Pesos 250,000 (US$5,300) with the runner-up taking home Pesos 120,000 (US$2,600). Liza del Rosario was richer by Pesos 100,000 (US$2,150) and Syakirah Yeoh won Pesos 50,000 (US$1,080). The top 16 Asian men and women made the cut for the fourth leg of the ABF Tour Philippines leg which will be played at the same bowling center and telecast LIVE over local station, NBN (Channel 4) commencing at 2.00pm local time. LIVE scores will be featured at www.abftour.com. Photos courtesy of Ms. Gina Avecilla. 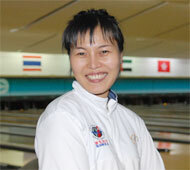 15th June, Manila: Liza Del Rosario of TBAM-Prima, Philippines and Oh Young Ki of Korea topped the 8-game first block Ladies' Open and Men's Open Masters finals of the 36th PBC-Boysen International Open at SM Bowling Centre Friday evening. At the start of the Ladies' first block finals contested on Friday morning, Malaysia's Syakirah Yeoh set a cracking pace with a 267 opener but local favourite, Liza del Rosario responded with 279 in the second game to grab the lead. The Filipina kept a relentless pace with 211 and 256 in her next two games to stretch her lead to 82 pins at the halfway mark from Zatil Iman hot on her heels after reeling off 268 and 216 in the third and fourth games behind teammate, Syakirah in second. Rosario went on to end the 8-game block with 214, 258, 246 and 191 to fend off the challenges of two Malaysian ladies, finishing on a total of 1867, a comfortable 83 pins margin. Zatil and Syakirah had to contend with 1784 and 1750 to trail the leader in second and third respectively. Last year's Vietnam Open champion, Kim Eun Jung kept close to the leaders to finish fourth with 1657 ahead of Youth Girls first runner-up, Marjo Reyes of TBAM-Prima, who took fifth spot with 1627. The surprise of the day was Oh Young Ki of Korea finishing ahead of Filipino, RJ Bautista of ATBA-Timberpro to top the Men's Open Masters first block finals. The Korean amassed a total of 1848, 98 pins from Bautista, who posted 1750 for second spot. Jo Nam Yi almost gave the Koreans a 1-2 finish when he took third spot with 1704 while Hong Kong's Wu Siu Hong did well to finish the 8-game block in fourth position on a score of 1684. 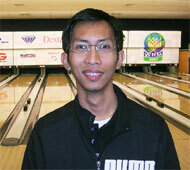 Fifth spot went to perfect gamer, Jeff Chan with 1674. Newly-crowned ABF Tour Saudi leg champion, Hussain Al-Suwaidi of UAE took sixth spot with 1664 followed by Eric Tseng of Hong Kong, Joonee Gatchalian of MTBA, Philippines, Kuwait Open champion, Ryan Lalisang of Indonesia and Markwin Tee of MTBA completing the top 10. Meanwhile, Ed Bermudez of MTBA captured the Men's Graded Masters title with a 12-game total of 2531 with Edgar Barroga of PBAP-Bowlmart and Edgar Gatchalian of TBAM settling for second and third with 2482 and 2430 respectively. The Ladies' Graded Masters title went to Alexis Sy of TBA-Prima who amassed 2320 for the victory. Dinah Basuel of Unique settled for second with 2205 while Hall of Famer, Bong Coo MBA-Prima-Timberpro finished third with 2131. The Ladies' and Men's Open Masters finalists will play another 8 games with pinfalls carried forward tomorrow (16th June) at the end of which the top 6 from each division will make the cut for the stepladder finals. Photos courtesy of Terence Yaw. 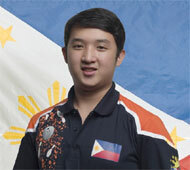 13th June, Manila: Perfect Gamer, Jeff Chan and fellow RP Pool rookie, Lara Posadas bowled big games on Wednesday, to bag themselves the Youth Masters titles of the 36th PBC-Boysen International Open Tenpin Bowling Championships at the ultra modern SM Bowling Center. Chan, carrying the colors of TBAM-Prima-Powerbowl, bucked a slow start to polish of high games of 290, 258 and 278 in the latter rounds for a 10-game total of 2228 and fend of the challenges of JC Tupaz (2182) also of TBAM-Prima and 2005 SEA Games Masters champ Markwin Tee (2147) of MTBA for the victory. Chan, who shot the tournament’s first perfect game, nearly mirrored the same feat with a 290 in the fifth game, that catapulted him into the lead and held on to annex his first international title. Tupaz on the other hand, nearly missed scoring the tournament’s third perfect game with a 299 in the penultimate game but settled for second. In the Senior's Masters finals held Tuesday, former SEA Games gold medallist Del Garcia representing Magallanes Bowling Association (MBA), clawed back with a 278 in the final game to overtake leader, Ed Bermudez of MTBA-Valiant for the men’s title. Garcia, displaying the form that made him a many-time national team member, jumped from fourth place in the penultimate game to bag the title with a 2109 aggregate. Ed Bermudez of MTBA-Valiant, also a former national team member, settled for second with 2037 ahead of another former RP player, Tony Ayson of TBAM-Prima who finished third with 2036. 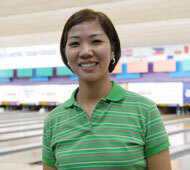 However, it was PBA’s (Pasig) Mila Robles who pulled off the shocker in the Ladies’ division. Robles led from nearly start to finish, annexing a 10 game handicapped total of 1979, to dash the hopes of International Hall of Famer, Bong Coo for her first PBC Senior's crown. Coo, playing out of the MBA-Timberpro, scored 1881 to edge back-up bowler Baby David (1864) of MTBA-PCA settling for third spot. Meanwhile, Asian Champion, Ryan Lalisang of Jaya Ancol Bowl, led the Men’s Open Masters overseas qualifying as the foreign participatants arrive for the two-week long tournament. Lalisang, who scored a rare double this year by capturing the Kuwait International Open and the ABF Tour Kuwait leg, amassed exactly 1000 to lead the men's leaderboard. Hong Kong's Wu Siu Hong, who rushed to the Manila after competing in the 1st Kingdom International in Saudi Arabia, fell short by one pin to claim second spot with 999 followed by current All-Events leader, Oh Young Ki of Korea third with 972. Julius Sy, newly-crowned Youth Boys Masters champion and Markwin Tee maintained their top 3 positions in the local pool with 1040, 977 and 970 respectively. Last year's Vietnam International Open champion, Kim Eun Jung of Korea, put in a superb performance to lead the Ladies' Open Masters table with 962. Kim, who is studying in Penang, Malaysia arrived together with the Malaysian team and was the first to easily make the finals. Malaysia's southpaw and Asian Youth gold medalist, Zatil Iman also impressed with a score fo 935 to claim second spot behind the Korean. 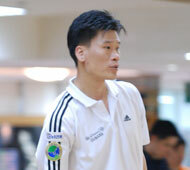 Hong Kong's spinner, Chan Shuk Han finished third with 877. Youth Girls Masters second runner-up, Apple Posadas continued to share the lead with Marjo Reyes in the local pool with 914 from Elaine Florencio in third on a score of 899.
champion, Kang Hyun Jin of Korea will contest the 8-game first block Masters finals on Friday, 15th June and another 8-game second block finals on Saturday, 16th June. The top 16 Asian finishers in the Masters event will qualify for the Philippine Leg, the fourth stop of the 2007 ABF Tour, which will also be held at the same venue. Photos courtesy of Francis De Leon, PBC. 10th June, Manila: Youth showed their prowess in the 36th PBC-Boysen International Open Tenpin Bowling Championships as Biboy Tajo and Dyan Coronacion emerged champions in the Men's and Ladies' Rookie Masters finals. Biboy Tajo, shot 1748 pinfalls to beat fellow youth bowlers, Paolo Darroca of PBA, and MBA-Paggor’s Joer Atienza into second and third position with pinfalls of 1713 and 1701 respectively for the coveted title. Tajo had a slow start managing only 144 but picked up pace in the second and third games. Despite another 149 in the fourth game, two back-to-back high games of 233 and 224 gave the youngster the lead and eventually ending the 10-games finals on top. The runner-up also had a slow start as well as sufferd two low games in his last two games to hand the title to Tajo while Atienza kept close with the leaders to finish a creditable third. Meanwhile, Dyan Coronacion tallied a total of 1741 pinfalls to topple MTBA’s Tess Eusebio for the Ladies' Rookie Masters crown. 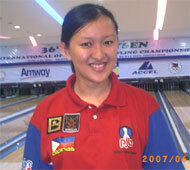 Eusebio rallied in the last two games to overtake early pace-setter, Anne Ramirez of PBAP-Bowlmart, who took third spot with 1646. RP Team standout Apple Posadas and RP Youth pool member Marjo Reyes shot identical 914 series to share top spot in the Ladies' Open Masters qualifying table. Erstwhile leader Elaine Ongpauco slid down to a tie with Liza del Rosario on 899 with third place going to Irene Benitez with 877. Julius Sy continued to lead the Men's Open category with his 1040, with perfect gamer, Jeff Chan (977) of TBAM-Prima and 2005 SEA Games Masters titlist Markwin Tee (970) following closely in second and third. Hong Kong’s Dennis Ip led the overseas pool on scoreboard with 815, ahead of fellow-compatriots, Eric Tseng and Eldan Lai on scores of 768 and 763. With the arrival of teams from Malaysia, Singapore, Kuwait and UAE starting Monday, scores are expected to soar. 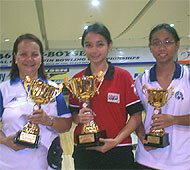 In other qualifying categories, PBAP’s Niqui Bernabe took the lead in the Youth Girl’s Masters overtaking division with (807) followed by Apple Posadas in second with 803.
International Hall of Famer Bong Coo of MBA-Timberpro, grabbed the lead in both the Ladies’ Graded Masters with an 853 series and the Ladies’ Senior Masters with 779 total. Mar Serac (913) of TBAM-Prima, SLETBA’s Miko Mendoza (867) and MTBA-Chinaph’s Lingling de Guzman (755) grabbed the lead in the Men’s Graded Masters, Men’s Associate Masters and Ladies’ Associate Masters events respectively. 7th June, Manila: Filipino National training rookies, Julius Sy and Jeff Chan provided the fireworks on the seventh day of the ongoing 36th PBC-Boysen International Open Tenpin Bowling Championships currently being held at the newly opened SM Bowling Center, at the Mall of Asia. Sy, carrying the colors of Cinaaph and MTBA, scorched the lanes with games of 279, 258, 256 and 247 for a 1040 pinfalls, the tournament’s first 1000 series to take the lead in the Open Masters event. 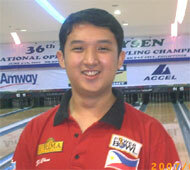 Jeff Chan, known in the local bowling circles as Mr. 600 for twice shooting successive perfect 300 games and also a member of the National youth team, sparked his 977 series with the tournament’s first perfecto. He shot lines of 225, 215 before following up with his 300 and ending with a 238 to take up second place behind Sy on 977. 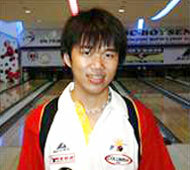 Early leader and 2005 SEA Games Masters gold medalist, Markwin Tee, slid down to third with 970. Meanwhile, leadership changed hands in the Ladies’ Open Masters qualifying as Elaine Florencio-Ongpauco downed 266, 235, 241 and 157 for a total score of 899 to assume leadership over fellow national team members Liza Del Rosario (853) and Apple Posadas (829). The tournament shifts into high gear this weekend, as the first batch of foreign participants arrive to participate in the tournament supported by Boysen Paints, Philippine Sports Commission, Department of Tourism (Philippines), ACCEL, SM Bowling Center and Amway (Phils).